All sounds have been recorded from a wide range of sound sources, including orchestral instruments, field recordings, granular and analogue synthesis with a host of special effects processing. The “Multi Layered” sounds are made up of various musical and non-musical elements which are separated into component parts. You can use these sounds as they are or take parts of some and mix with others. ‘Playable Instruments and Pads’ are tuned sounds that can be played on a keyboard. Although this pack is not designed to be a musical instrument, these sounds can be played melodically. The ‘Risers, Sweeps and Impacts’ folder contain all the single sound FX in these categories. Finally, ‘Textures and Drones’ contain a variety of soundscapes, ambiences, in harmonic noises, strange sounds and other sound effects. Every one of these unique sounds has been created with cinema, film score and game sound design in mind, but will work equally well in techno, ambient, drum ‘n’ bass and many other electronic music genres. 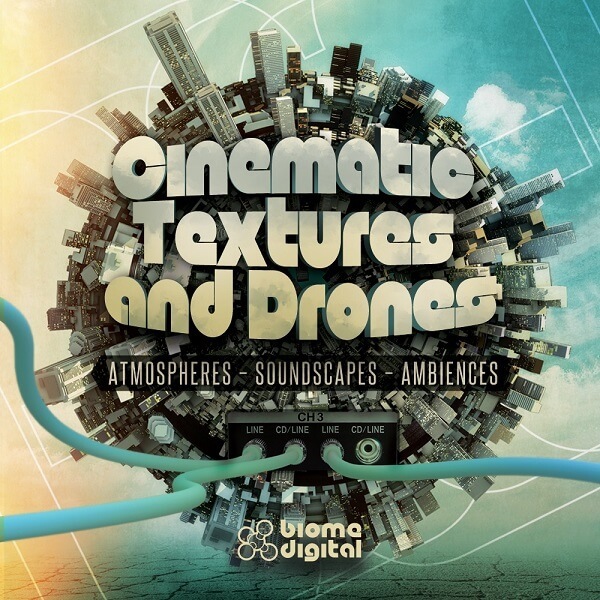 As with all Biome Digital sample packs, Cinematic Textures and Drones is 100% royalty free to use in your original musical compositions. We are sure you will find this sound library a great source of inspiration for years to come. Try the free demo pack now to make sure this product is compatible with your software.